It may be called a passive house, but R-951 is actively attracting the attention of prospective buyers in Prospect Heights with its many energy-saving features and luxurious green amenities. 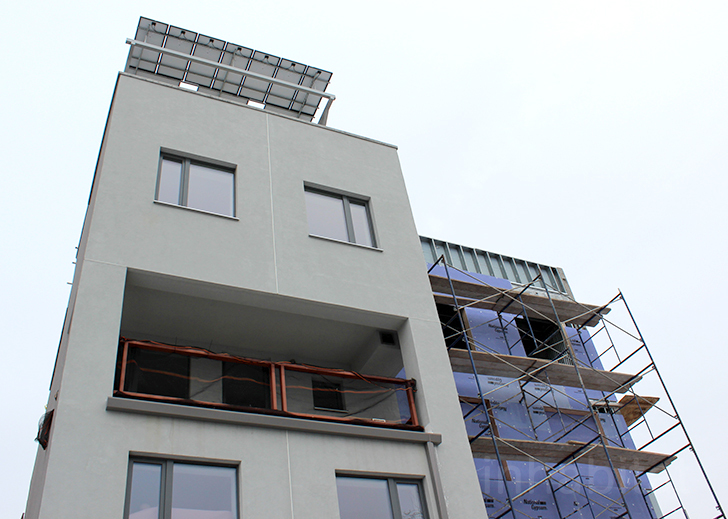 The first solar-powered, passive house condo building in Brooklyn (and possibly in New York City) to meet certified Passive House standards and achieve Net-Zero capability, R-951 comprises three spacious duplex apartments with open floorplans, state-of-the-art appliances, high ceilings, outdoor space and plenty of natural light and fresh air. Inhabitat recently had a chance to tour the nearly complete units -- come along with us on a photo tour and see if you can imagine yourself living in one of these innovative, money-saving new green homes. R-951 was named for its resilience and high R-value (a measure of thermal resistance) as well as its address at 951 Pacific Street. The first project of Further, Inc., a design/build development firm specializing in sustainable construction formed by eco-designer and Green Map founder Wendy Brawer, architect Paul Castrucci, and electrical contractor Ray Sage, the structure boasts a super-tight building envelope made up of Insulating Concrete Forms (ICFs), as well as triple-glazed high-performance doors and windows to minimize energy loss. Each of the three apartments also has its own Mitsubishi high-efficiency heating and cooling system, high-efficiency heat pump hot water heater by Steibel Eltron, and Zehnder energy recovery ventilation system (ERV) to provide a continuous supply of fresh air. Ranging from 1,492-1,617 square feet of space, each residence offers floor-through layouts and multiple private outdoor spaces. The first floor residence is a two-bedroom unit with that opens out onto an expansive backyard. The middle unit has three bedrooms, and features a small balcony off of the living room as well as a larger balcony accessed through the master bedroom. In addition to saving energy with its well-insulated shell, R-951 has the ability to make its own power with a 12.2 kW rooftop photovoltaic system, which can provide each unit with about 4 kW of power (the average amount used by a typical NYC condo). The PV system allows the meter to roll back when power is not used by the homes, but the coolest feature may be that transformerless inverters give homeowners the option to utilize their solar electricity to charge phones and other small electronics during emergencies when the grid is down. Further, Inc. recently announced that R-951 was able to meet all NYSERDA Net-Zero Energy Home thresholds with its grid-tied system, meaning that (dependent on the behavior of the inhabitants) on average, over the year, the units have the potential of functioning using only the energy they generate. The top unit is another three-bedroom apartment with access to two rooftop decks. While R-951’s green features are better for the Earth, they’ll also create a noticeably more comfortable environment for residents. The triple-glazed windows and doors do double-duty to block out noise and keep rooms warm in the winter and cool in the summer, while the energy recovery ventilation systems ensure that inhabitants won’t be breathing the same stale air over and over again. Beautiful oak floors certified by the Sustainable Forestry Initiative, Benjamin Moore Green Promise low-VOC paint, luxurious stone and marble finishes and stainless steel appliances (including an induction cooktop and convection oven certainly don’t hurt either. Interested in making R-951 your new home? The top-floor duplex has already been purchased but the two other units are still available for sale at approximately $1.5 million each. See the listings for Apartment 1 and Apartment 2 here and here. This is a great project. Imagine if this was the most common method of development. We'd be on our way to a net zero city. Now what would that do for the planet? The leaders of the project, Paul Castruccci and Ray Sage have shown extraordinary persistence and commitment to carry this to the finish line. This is leadership that our city needs. Ranging from 1,492-1,617 square feet of space, each residence offers floor-through layouts and multiple private outdoor spaces. The first floor residence is a two-bedroom unit with that opens out onto an expansive backyard. The first floor features an open living area that opens out right onto a gigantic back yard. On the lower level, a rec room leads out to the same yard. The free-form layout considered that the homeowner may want to arrange the rec room into two smaller rooms. The second level has a small balcony off of the living room. The second floor unit has two small bedrooms on its first level. The upper floor has its own balcony off of the master bedroom. The homeowners will be able to walk right out onto their own outdoor space when they wake up in the morning. The top-level apartment has already been purchased. The top floor has two outdoor decks. The bathroom has direct access to a private outdoor space! A solar-shading screen feature for the facade will reduce the heat that enters the apartments during the summer. R-951 was named for its resilience and high R-value (a measure of thermal resistance) as well as its address at 951 Pacific Street. The first project of Further, Inc., a design/build development firm specializing in sustainable construction formed by eco-designer and Green Map founder Wendy Brawer, architect Paul Castrucci, and electrical contractor Ray Sage, the structure boasts a super-tight building envelope made up of Insulating Concrete Forms (ICFs), as well as triple-glazed high-performance doors and windows to minimize energy loss. Each of the three apartments also has its own Mitsubishi high-efficiency heating and cooling system. High-efficiency heat pumps by Steibel Eltron supply hot water to the units and Zehnder energy recovery ventilation systems (ERVs) provide a continuous supply of fresh air. In addition to saving energy with its well-insulated shell, R-951 has the ability to make its own power with a 12.2 kW rooftop photovoltaic system, which can provide each unit with about 4 kW of power (the average amount used by a typical NYC condo). The PV system allows the meter to roll back when power is not used by the homes. But the coolest feature may be that transformerless inverters give homeowners the option to utilize their solar electricity to charge phones and other small electronics during emergencies when the grid is down. Further, Inc. recently announced that R-951 was able to meet all NYSERDA Net-Zero Energy Home thresholds with its grid-tied system, meaning that (dependent on the behavior of the inhabitants) on average, over the year, the units have the potential of functioning using only the energy they generate. While R-951's green features are better for the Earth, they'll also create a noticeably more comfortable environment for residents. Beautiful oak floors certified by the Sustainable Forestry Initiative, Benjamin Moore Green Promise low-VOC paint, luxurious stone and marble finishes and stainless steel appliances (including an induction cooktop and convection oven certainly don't hurt either.